I have heard people have had increasing difficulties uploading their data to Carelink. Some times the site is just slow, for sure, but another thing seems to be the new permissions for Java applets in Safari web browser. In the Sierra version of OSX, Safari hides the "Run in Safe Mode" selection by default. You need to hold the Option key pressed down when selecting the permissions for the Carelink site in order to see it and to toggle it off. Select Java from the list on the left. 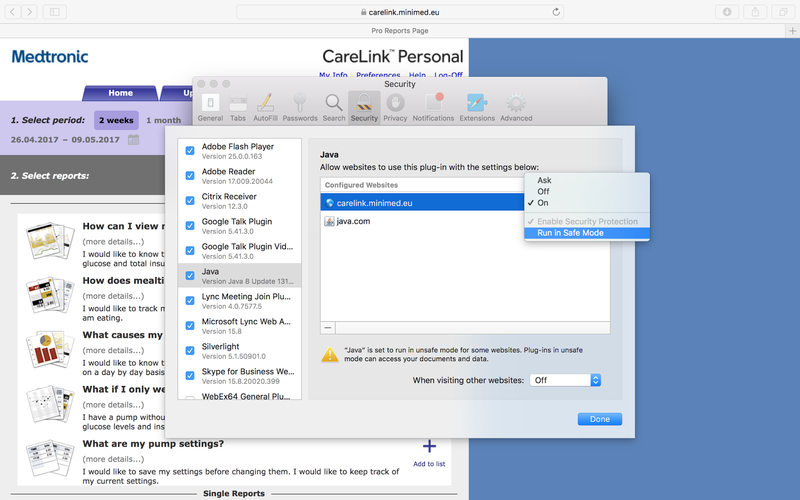 Select the Carelink site, and hold the Option key (alt) down when accessing the On/Off selection. You'll see the Run in Safe Mode selection on the bottom. Just untick it, and you're done. Let me know in the comments whether you still run into issues with the upload. I'm happy to help you further. 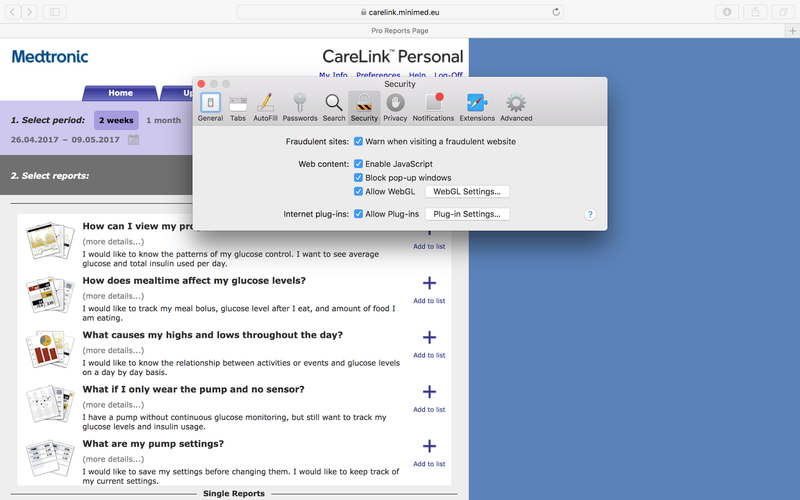 This guide is mainly aimed for people who used to be able to upload their data to Carelink, but can't do it anymore. If you have never uploaded your data, there's some more effort involved. You need to get Java enabled in Safari in the first place. Even then, I hope this guide will be beneficial in assuring people that yes, it really can be done. MedAngel kindly sent me a new kind of a diabetes related gadget to try out, on the condition that I'd share my experiences with it. This gadget keeps me safe by guarding the temperature of my insulins. I got the device just in time for a trip to the United Arab Emirates. That was just perfect, as I had been thinking of the temperatures. Finland, where I live, is currently quite cool, with temperatures usually below freezing point (0 °C, 32 °F). 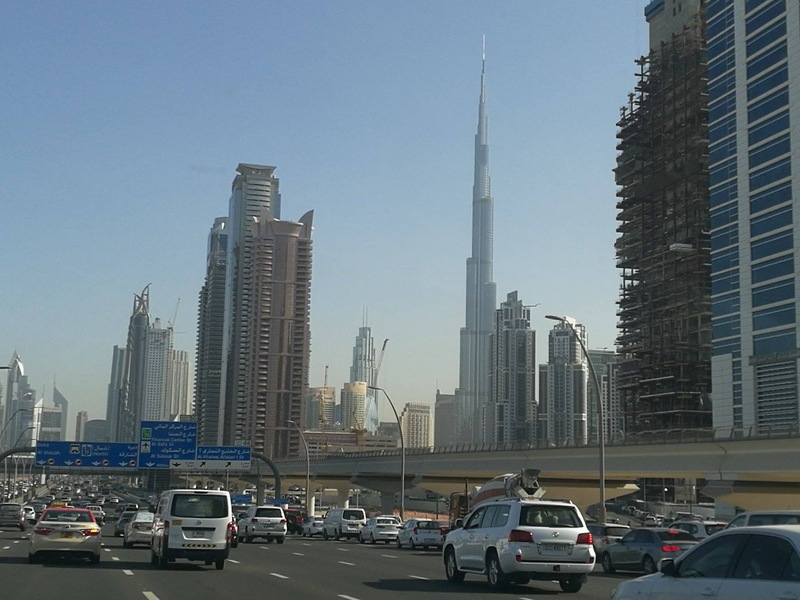 It's winter time in the UAE too, but it can still get quite hot there. I have had my insulin damaged by temperature a couple of times. I can't directly see it from my insulin, it remains a transparent liquid. I notice it when that liquid loses it's capacity to keep my blood glucose levels down, even when I change the cannula of my insulin pump system, when I dose more and more of it, and my glucose levels still keep rising. When I then finally refill the cartridge of my pump with fresh insulin, and my glucose levels finally start to come down, I know there was something wrong with the old insulin. And when I think back, I recall being outside at a park, for instance, where my pump may have been exposed to direct sunlight (in which case the black device absorbs the heat and becomes warmer than the surrounding air). Or I may have been out in Finnish winter, with temperatures well below freezing point, and some of that cold may have reached my pump, even though I try to protect it. The insulin I'm carrying in my pump is one concern, and I wish the pump itself would have a thermometer and warn me if it gets too hot or cold. The other concern is with my reserve insulin, the vials I fill my pump cartridges from. When I travel, I need to keep that reserve insulin with me, and I need to protect it from extreme temperatures as well as I guard my pump. But it just may happen that the reserve insulin is in a bag that I leave to the car when stopping for a lunch, and the temperature in the car when I return from the lunch may be quite cold (Finnish winter) or hot (in the UAE, or even in Finland in summer time). Unfortunately, it's quite easy for me to make that error and leave the reserve insulin in the car. Most of my internal processing power when stopping for lunch is targeted to what I'm going to have for lunch, how much insulin I should dose to that, and when. When something like that happens, I'd like to have a device like MedAngel One, next to the insulin. So far I have been lucky if I have even noticed my error. And even when I have, I haven't had a good idea about whether the insulin has really suffered. 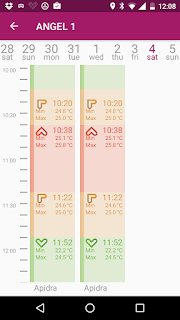 With MedAngel One, I can see what temperature the insulin has been exposed to, and for how long. In the UAE, it never gets hot indoors. Every place is air conditioned, very efficiently. And not just indoors. Even bus stops outside are air conditioned, keeping the local atmosphere at the bus stop cool even when the air just a few steps away exceeds the human body temperature (around 37 °C, 100 °F). This lead me to not think about the heat too much. 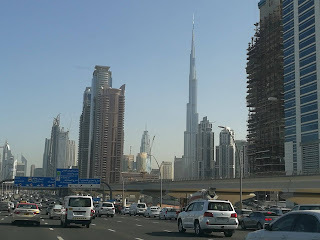 When driving 2 hours from Abu Dhabi to Dubai on a nice, wide motorway it was really quite comfortable on the driver's seat. However, my luggage in the trunk was positioned so that the reserve insulin inside was on the top, and the top of the luggage was exposed to direct sunlight throughout the drive. Again, a situation I would have paid no attention to without the thermometer next to the insulins. 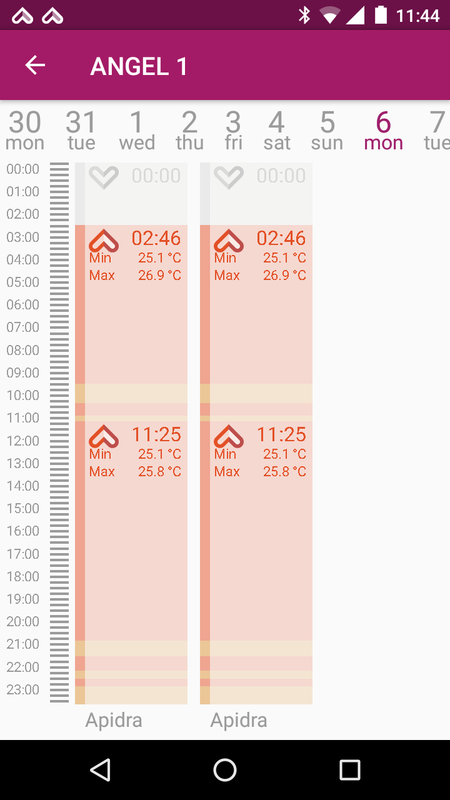 But when I checked the MedAngel app later that day, I noticed the insulins had indeed been exposed to some moderate heat. I'm a big fan of learning. 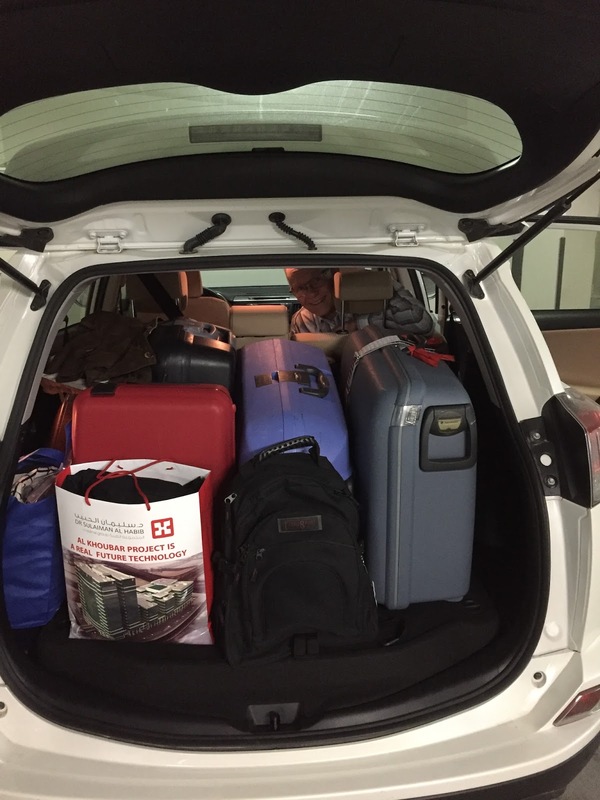 So next time I'm loading the luggage in the trunk, I know to think of the positioning of the luggage, and of the position of the placement of the insulin within the luggage. The MedAngel One could have helped me even better, if I had let it. It could have alerted me in real time when the temperature within the luggage started to rise. However, the smartphone app that talks with the thermometer was only available on Android during our trip, and my primary phone was iPhone. I had an Android phone with me too, but during that drive it was packed in the same red luggage, and turned off. So I missed the opportunity to learn how it feels like when a guardian angel warns you before something threatening is about to happen, but I'm sure I'll get to learn that sometime in the future. Back at home I learned yet another thing. When I unpacked my luggage, I left the small bag with the reserve insulin on a table in our bathroom. I know it's our hottest room, and should be warm to help keep it dry. But I had no idea it was actually warmer than 25 °C, and therefore not a good place to leave my insulin into. Right now the gadget is in the fridge, guarding the storage temperature of my reserve insulins. The temperature there may drop too low too, as I learn happened with the founder of MedAngel. And there may be a power blackout while I'm away, in which case it will be super nice to be able to check whether that has potentially affected my insulins. 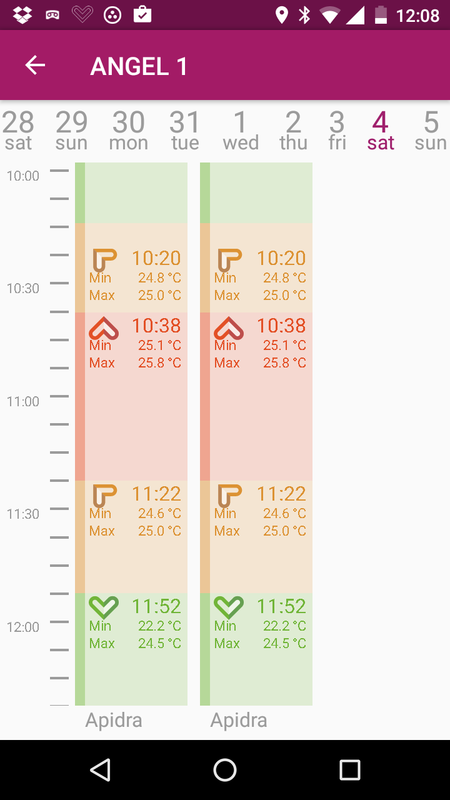 I really like the device and the app. I had no trouble taking them into use, found every feature I was looking for with ease, and had no problems or hick-ups during use. This is what I call good design. I know there are some similar products available too, like the Likelle containers with a premium look and price point. But for my preferences just a simple small gadget I can slip in with my reserve insulins works better. I'm keeping mine, and am considering ordering another one. You can learn more about the device at medangel.co. Besides getting my own device for free, I have no affiliation or other ties to MedAngel.